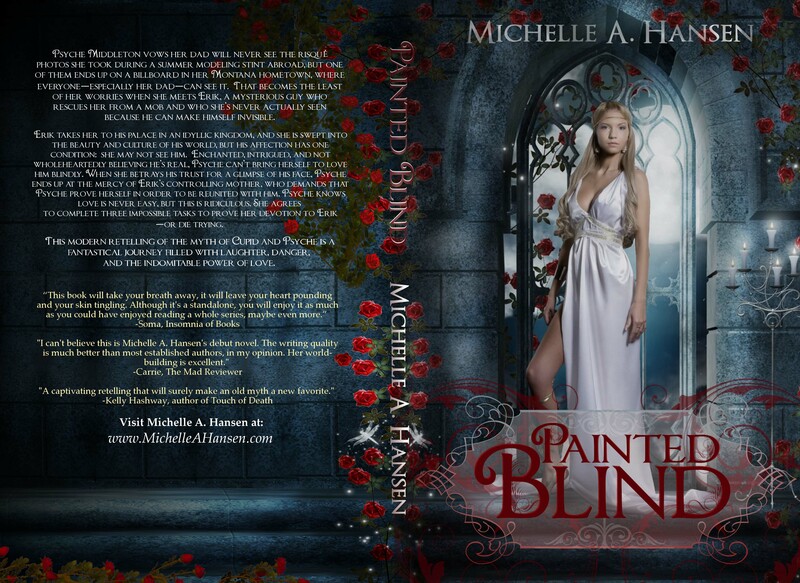 Remember back in August, when Painted Blind went on blog tour? The tour was fabulous, but one little thing kept popping up in reviews– the cover. For some reason, the cover wasn’t connecting with readers. It wasn’t doing its job. Much as I loved the photo we used in the original cover, I wondered if I should come up with a new look. Because I was just starting my masters, it was kind of a back-burner project UNTIL cover designer Emma Michaels announced a cover art sale on her Facebook page. I clicked her link and browsed the site and THERE IT WAS– a photo of Psyche. When I saw it, I said, “That should the be the cover of my book.” So, I contacted Emma and bought the cover. This entry was posted in announcements, blog tours, book release, cupid & psyche, greek mythology, Painted Blind by michelle. Bookmark the permalink. I agree that this sells the fantasy element rather than the contemporary side. I think it will do better in the market that way. Thanks for stopping by Lexa! It’s a hard call to make, but I am hoping this will give the book wider appeal. Thanks for your comments, Marysue. I love all you dedicated bloggers!